Spent the morning packing and just lounging around the house in Seattle. After saying our goodbyes, we cruised on the Interstate, headed for Vancouver, BC. Ever since my good friend David introduced me to this chain of sukiyaki restaurants, I've visited it time & time again. Actually, I've been here every single time I've been in Vancouver! Lucy chose to go to this location in Richmond because it was their first. You would think it should be the best, since it's been open the longest! Things were a little different this time around, because yesterday was the first day of their new menu. Since they're still testing out the waters, they were offering 20% off the new concept. 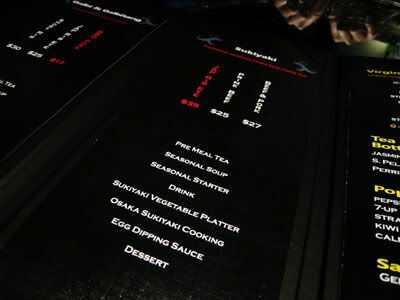 They've introduced a set dinner, which is composed of: soup, a starter, drink, classic sukiyaki, and dessert to follow. 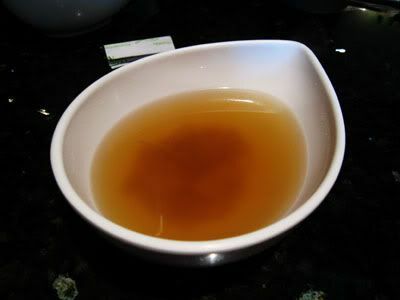 The seasonal soup was a mushroom based soup - clear broth with mushroom pieces at the bottom. The broth was tasty, but definitely on the salty side. The appetizer course was pretty interesting - it was like a fusion dish of sorts. 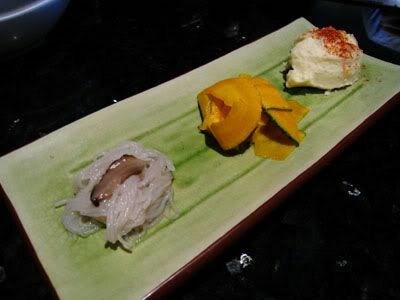 Konnyaku noodles mixed and seasoned with shiitake mushrooms, a passionfruit salad and mashed potatoes. I found that the noodles were overcooked, leaning to the soggy side, and the passionfruit quite heavily seasoned with vinagrette. However, I did like the mashed potatoes with little corn bits in it! To start off the sukiyaki pot, our waitress started frying/searing the veggies and meat to create the base of the soup. 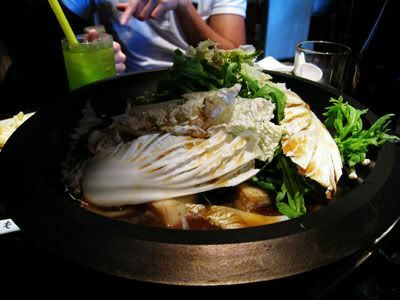 The tables are no longer supplied with water & sukiyaki soup ingredients, the waitresses bring it to the table for you. I guess this way they have better control over food usage and flavour control so that everyone has an equal experience when they go to the restaurant. Included in the price of the meal is a complimentary drink. I've always been a fan of their virgin concoctions, so I ordered the Strawberry twist to try out. 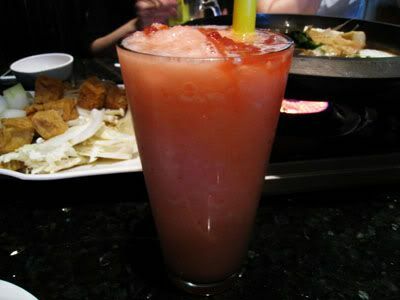 It was basically a strawberry slush with fresh strawberry pieces sitting at the bottom. It was not too sweet, and really refreshing throughout the meal! The restaurant normally closes at 11pm on weeknights, and since we were having a late dinner, we were the only table left at 10pm. The waitresses seemed to want us out of the restaurant, and were rushing us around 10, which I found to be pretty unprofessional. They asked us to pay for our bill while we were still eating, so that they could get a head start on closing the restaurant. Not too impressed with their service at this location, but the food is always good. When we finished with our meal, the waitress had forgotten about our dessert, and we had to remind her about it. 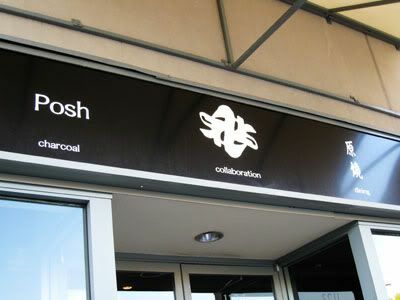 It seems like since today was the first day of their new menu, they aren't quite familiar with what they have on there. After they get the hang of it, I'm sure things will run a lot smoother. 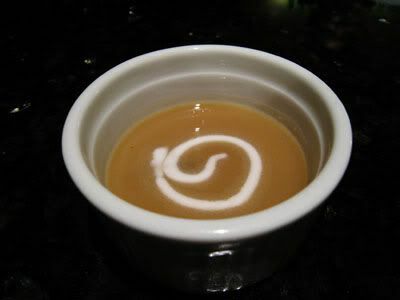 The dessert was reminiscent of Chinese dessert soup, where this one was made with green beans and swirled with thickened almond milk in the middle. It really wasn't all that special, and the portion was small, so I wouldn't get too excited about this one. It was nice to see Lucy again, it's so hard to keep in touch with each other since we have such busy schedules! 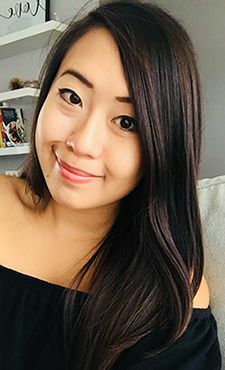 I can't wait to be back in Vancouver again so we can eat together and try out something new!